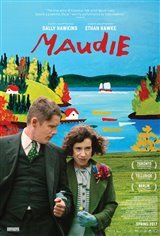 In Nova Scotia, Maud Lewis (Sally Hawkins), who suffers from severe arthritis, is hired as a housekeeper by reclusive local fish peddler Everett Lewis (Ethan Hawke). Despite her crippled hands, Maud yearns to be independent and to live away from her overprotective family, but most of all, she wants to create art. An unlikely romance blossoms between herself and Everett, as she determinedly hones her skills despite her pain, and overcomes the physical challenge of juvenile rheumatoid arthritis. She eventually rises to become one of Canada’s premier folk artists, whose paintings hang in The White House. Canadian Connection: Filmed in Newfoundland. Several cast members are Canadian.